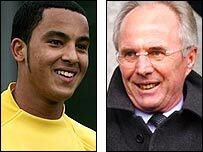 England boss Sven-Goran Eriksson has revealed he picked Arsenal teenager Theo Walcott for the World Cup despite never having seen him play a match. The 17-year-old striker was the shock inclusion in the 23-man squad. "I've seen him perhaps three times in training," said Eriksson. "At Arsenal training on Saturday I saw him play 11 against 11 on a half pitch. "You can see how good the technique is because space is very small. And I saw him do some finishing." Arsenal signed Walcott from Southampton in January in a deal worth up to £12.5m but he has yet to make his Gunners debut. Walcott will miss Arsenal's Champions League final against Barcelona on 17 May to join the England squad. Arsenal boss Arsene Wenger has told Eriksson he can take Walcott to next week's England training camp in Portugal as long as the Gunners are not hit by new injuries. Eriksson said he had been getting regular updates on Walcott from Wenger and England's youth coaches ahead of this summer's tournament in Germany. "I was starting to think about him in January, February and March," stated Eriksson, whose decision to select Walcott was backed by 84% in a phone poll conducted by BBC Radio Five Live. "The first thing I had to check was whether he can handle it and everyone we spoke to said yes. He is a very steady boy. "I don't think Walcott or Arsene Wenger thinks he is going to play seven games of 90 minutes in the World Cup. "If you expect him to have the impact Pele had in 1958, we are talking about the wrong things but I am excited about it." Eriksson said Walcott could play in the injured Wayne Rooney's role, off the main striker, if the Manchester United star does not recover in time after breaking a bone in his foot. However, Eriksson said he also planned to use Chelsea's Joe Cole in that position. England goalkeeping coach Ray Clemence says Walcott is believed to be quicker than Arsenal team-mate Thierry Henry. The teenager's express pace is thought to be a major factor in his shock selection. "He is quicker than Henry apparently and I've seen him in youth games where he is exceptionally quick," Clemence told BBC Sport. "I've not seen a race between the two of them but according to tests he is quicker than Henry now. If he is then that is some talent." Eriksson's right-hand man, Tord Grip, has closely followed Walcott during his rapid rise. "The first time I saw him was over a year ago in a tournament in Portugal," Grip told BBC Sport. "He played in a 4-3-3 system to the right and did well and then I followed him at Southampton where he got into the first-team and played some Championship games. "Then we followed him since he became an Arsenal player. "I've been to the Arsenal training ground three or four times and seen him training and in matches. "He is an exciting player and has got the potential to be very good so, why not take a gamble and see if he can do well for us? "I think his best position is central striker."